For the ships, see Rurik (1851), Rurik (1892), and Rurik (1906). Rurik (also Riurik; Old Church Slavonic Рюрикъ Rjurikŭ, from Old Norse Hrøríkʀ; c. 830 – 879), according to the 12th-century Primary Chronicle, was a Varangian chieftain of the Rus' who in the year 862 gained control of Ladoga, and built the Holmgard settlement near Novgorod. He is the founder of the Rurik Dynasty, which ruled the Kievan Rus' and its successor states, including the Grand Duchy of Moscow and the Tsardom of Russia, until the 17th century. 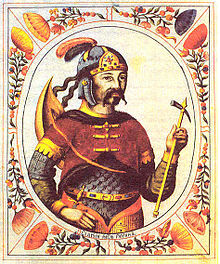 According to the Primary Chronicle, Rurik was one of the Rus', a Varangian tribe likened by the chronicler to Danes, Swedes, Angles, and Gotlanders. Sineus established himself at Beloozero (now Belozersk), on the shores of lake Beloye, and Truvor at Izborsk (or at Pskov). Truvor and Sineus died shortly after the establishment of their territories, and Rurik consolidated these lands into his own territory. The name Rurik is accepted to be a form of the Old Norse name Hrærekr. This has been taken as evidence that Rurik was in some way ethnically Scandinavian. The only similarly named figure described in the Carolingian Annales Fuldenses and Annales Bertiniani was Rorik of Dorestad (also spelled Rørik, Rörik, Roerik, Hrörek, etc. ), a Germanic king from the royal Scylding house of Haithabu in the Jutland Peninsula. Since the 19th century, there have been attempts to identify him with the Rurik of Russian chronicles. 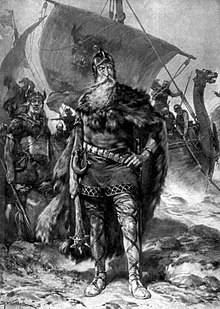 Rorik of Dorestad was a member of one of two competing families reported in the Frankish chroniclers as having ruled the nascent Danish kingdom at Hedeby, and was likely nephew of king Harold Klak. He is mentioned as receiving lands in Friesland from Emperor Louis I. This was not enough for him, and he started to plunder neighbouring lands: he took Dorestad in 850, attacked Hedeby in 857, and looted Bremen in 859, yet his own lands were ravaged in his absence. The Emperor was enraged and stripped him of all his possessions in 860. After that, Rorik disappears from the Western sources for a considerable period of time, while only two years later, in 862, the Russian chronicle's Rurik arrives in the eastern Baltic, builds the fortress of Ladoga, and later moves to Novgorod. In Estonian folklore there is a tale of three brothers, who were born as sons of a peasant, but through great bravery and courageousness later became all rulers in foreign countries. The brothers were called Rahurikkuja (Troublemaker), Siniuss (Blue snake) and Truuvaar (Loyal man)(estonianized names for Rurik and his brothers Sineus and Truvor), names given to them by their childhood friend, a blue snake. ^ Christian Raffensperger and Norman W. Ingham, "Rurik and the First Rurikids," The American Genealogist, 82 (2007), 1–13, 111–19. ^ Kirpichnikov, Anatoliy N. (2004). "A Viking Period workshop in Staraya Ladoga, excavated in 1997" (PDF). Journal of Swedish Antiquarian Research. Retrieved 17 September 2015. ^ Kirpichnikov, Anatoly H. "Сказание о призвании варягов. Анализ и возможности источника". Первые скандинавские чтения, СПб; 1997; ch. 7–18. ^ Nazarenko, Alexander. "Rjurik и Riis Th., Rorik", Lexikon des Mittelalters, VII; Munich, 1995; pp. 880, 1026. ^ Andrei Mozzhukhin (5 October 2014). «Рюрик — это легенда» ["Rurik – is a legend"] (in Russian). Russian Planet. Retrieved 12 November 2014. Interview with Igor Danilevsky. Wikimedia Commons has media related to Rurik. Year 862 (DCCCLXII) was a common year starting on Thursday of the Julian calendar. Garðaríki or Garðaveldi is the Old Norse term used in medieval times for the states of Kievan Rus'. Sineus and Truvor, according to the 12th-century Primary Chronicle, were the brothers of Rurik of the Varangian Rus tribe. For a long time two names were believed to be a Slavic misunderstanding based on the Scandinavian expressions Trú vor and Sine hus. However, modern researches of old Scandinavian dialects demonstrate fallibility of that interpretation. Rorik was a Danish Viking, who ruled over parts of Friesland between 841 and 873, conquering Dorestad and Utrecht in 850. Rorik swore allegiance to Louis the German in 873. He died at some point between 873 and 882. Gnezdovo or Gnyozdovo is an archeological site located near the village of Gnyozdovo in Smolensky District, Smolensk Oblast, Russia. 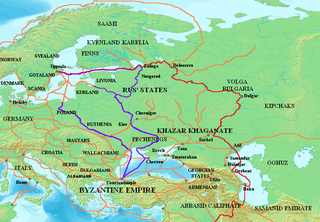 The site contains extensive remains of a Slavic-Varangian settlement that flourished in the 10th century as a major trade station on the trade route from the Varangians to the Greeks. Roderick is a Germanic name, recorded from the 8th century onward. Its Old High German forms are Hrodric, Chrodericus, Hroderich, Roderich, Ruodrich (etc. ); in Gothic language Hrōþireiks; in Old English language it appears as Hrēðrīc or Hroðrīc, and in Old Norse as Hrǿríkʀ.